Apartment Description: 303 Alderman is a well maintained, ranch style home located off Alderman Road, steps from UVA! Enjoy a huge eat-in kitchen with new appliances, a formal dining room, garage with storage space, and a large laundry room and storage area. Home features hardwood floors throughout and lots of charm! Backyard is great for entertaining with a bricked patio and walls, and space for a garden. Sorry, no undergrads or pets. 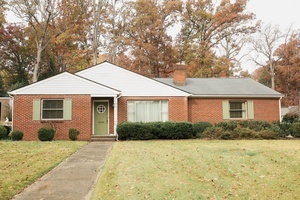 Overall Property: 303 Alderman is a well maintained, ranch style home located off Alderman Road, steps from UVA! Enjoy a huge eat-in kitchen with new appliances, a formal dining room, garage with storage space, and a large laundry room and storage area. Home features hardwood floors throughout and lots of charm! Backyard is great for entertaining with a bricked patio and walls, and space for a garden. Sorry, no undergrads or pets.